Growing up in Kenya, the Ruto brothers couldn’t recall ever having a consistent water supply. Ken and Denis would often go days and weeks without running water, as over 50% of Kenya’s water resources are lost to theft, corruption, or leakage in the aging analog systems. Like other families, they’d buy water from unscreened sources, which was not only expensive but potentially dangerous. The Kenyan government has had no way to track these water losses, which is where Denis and Ken formed the idea for their innovation, Flux. Flux is a small, affordable, easy-to-install, smart water meter that tracks water consumption and is engineered to work with Kenya’s unique infrastructure. By focusing on water wastage, the Flux meter can help water utilities promptly identify leaks as well as illegal connections, to improve access to clean water. Ken, now a junior studying computer science and mathematics at Haverford College, explains that Flux will help predict and prevent water crises such as the one that hit Kenya in 2018. Water has long been an issue in Kenya, and 41% of Kenyans still rely on unimproved water sources, such as ponds, shallow wells, and rivers. This situation worsened in 2018, however, by a prolonged drought that impacted residents in towns not normally affected by inadequate water supply who saw the water from their taps disappear for months. The level of water in major rivers such as the Isiukhu hit all-time lows, while others dried up completely. Analysts blame the water crisis on factors that continue unabated, including climate change, destruction of forests, and poor water management; they also note that water issues are likely to worsen unless these problems are tackled. The Flux meter is prepared to tackle one aspect of the problem, and the Ruto brothers estimate that with the money saved through the detection of water loss, utilities will be able to increase access to water and sanitation by over 50%. 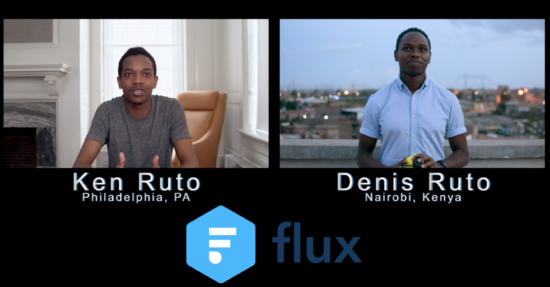 The Cisco Global Problem Solver Challenge team is pleased to give Flux the support they deserve, as they work to bring this innovative product to bear in helping solve one of the world’s most pressing issues. The Flux team won US$25,000 in the 2018 Cisco Global Problem Solver Challenge. Enterprising students or recent grads with their own innovative technology-based solution with a focus on social good should apply to this year’s Challenge by January 11th, 2019 for the opportunity to win up to US$100k.